Beware of swine flu – it seems to be a contagious disease! 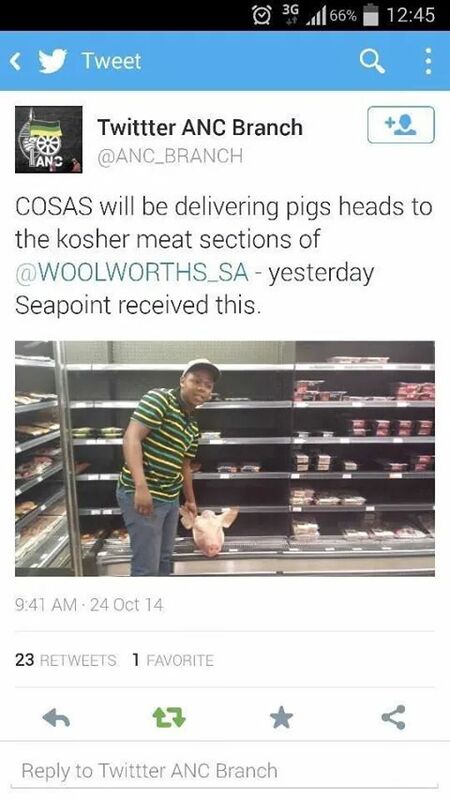 Several weeks ago, members of COSAS, the Council of South African Students placed a pig’s head in what they thought was the Kosher meat section of Woolworth’s Sea Point store. Turn out in their infinite stupidity, they had placed it in the Halaal section but then again, this bunch have never been famous for their cerebral prowess. Hate speech, much like swine flu, seems to be a contagious disease. This is a disease that is spreading like wildfire throughout the world. South Africa is not immune. Over the last few months social media sites on Facebook and Twitter have been infested with the kind of comments that would not have been out of place in Germany circa 1938 and many of the perpetrators are linked to government departments and political parties. 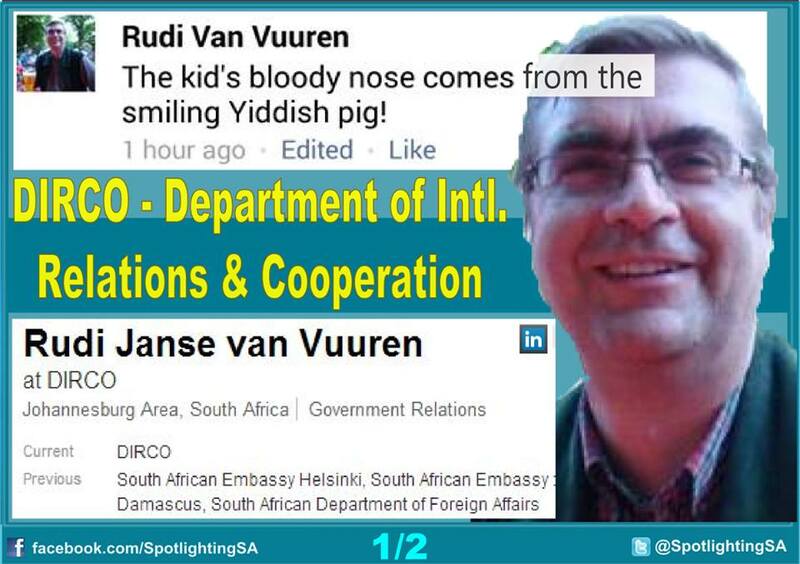 We have had the illustrious Rene Smit, social media manager of the ANC Western Cape branch posting “Hitler was right” and now DIRCO (Department of International Relations) employee, Rudi van Vuuren, who has enjoyed diplomatic postings to Helsinki and Damascus is the latest little piggy who is going to market. I know the very definition of diplomacy is telling someone to go to hell and making sure they enjoy the ride but this is beyond reprehensible. Hiding behind the excuse “well he was tweeting/commenting in his private capacity” is just not going to cut the mustard. Anti-Semitism is rising to alarming levels around the world and has arrived in South Africa. South Africa boasts a Constitution that protects the rights of minority communities and since the fall of Apartheid has been an example of conflict resolution but the lack of sanction on officials that feel like they have free reign on social media to spout their hate invective has transported the Rainbow nation back in time. It is a flagrant abuse of office to use social media platforms to bring their latent anti-Semitic tendencies to the fore. It seems as if it is open season to say whatever you want to against the Jewish community with very few repercussions. It is time for ordinary South Africans who are sick and tired of the Middle East taking preference over pressing issues in their country to say enough is enough. It is time for ordinary South Africans who fought long and hard to triumph over the dark past of the country to say enough is enough. Enough of the hatred. Enough of the abuse of office. Enough. It is time for ordinary South Africans to say that the Jewish community are just as much a stripe in the Rainbow Nation as any other and any hate invective against them will not be tolerated. This particular strain of swine flu has to be stopped from spreading at all costs before the epidemic gets out of hand and starts to manifest violent symptoms. “We received information from an online organisation called ‘SpotlightingSA’ which combats Antisemitism and false narratives concerning Israel. Spotlighting primarily focuses on South Africa but deals with the same issues in the UK and Australia. Spotlighting is a grassroots initiative which also monitors Antisemitism and holds individuals accountable for racism, bias, bigotry and above all Antisemitism. Spotlighting is an independent organisation unaffiliated to any organisation or political agenda”. Someone once said don’t get in the mud with the pigs, because you both get dirty and the pig enjoys it. It would appear as if the BDS (Boycott Divestment Sanction) movement has developed quite an appetite for pigs. While it is tempting to indulge in pig puns, this is fast becoming a very serious issue. If it is not Roger Waters flouting his helium pigs decorated with stars of David at his concerts, it is the Council of South African Students who have deemed if perfectly acceptable to place pigs heads in the meat section of Woolworths stores in South Africa. Why Woolworths? Why pigs? Woolworths, one of South Africa’s most respected and popular brands that sells home ware, food and clothing has been the target of demonstration and boycott by BDS SA. The fact that Woolies imports from Israel amount to barely a percent is irrelevant to BDS. They have firmly locked their target on the upmarket store and demonstrations, threats against shoppers and staff and violence have become the order of the day. Nearly 60 protesters, including children were arrested for disturbing the peace two weeks ago. 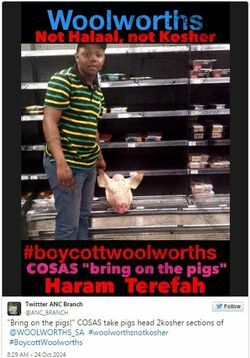 The morons from COSAS who placed a pig’s head in the meat section of Woolworths’ Sea Point branch have not only offended the Jewish community but Muslims as well. The porky creature is forbidden to both religions and to Jews the image or use of a pig has been seen as a symbol of anti-Semitism since time immemorial. Why COSAS, who quite frankly should be concentrating on their university studies are so fixated on Israel at the expense of so many problems that plague not just South Africa but the African continent is beyond me. Civil war, dire poverty, starvation and disease are all problems that plague the continent but are ignored so that anti-Semites can indulge their latent tendencies. Policies of BDS are counter-productive to peace and the ordinary citizens of South Africa who benefit from Israeli know-how in science, medicine, technology and farming are the ones who lose. 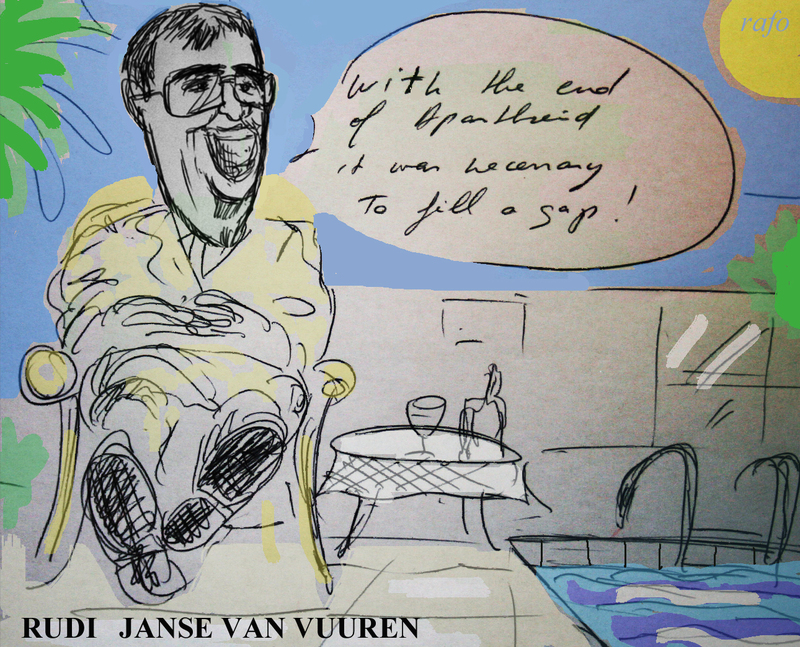 In a recent twist of events COSAS distanced itself from the Woolworths Pig Head incident by releasing a statement that said that while they unequivocally support the Palestinian cause, they distance themselves from the incident at Woolworths Sea Point, intimating that the culprit, Siphakhamise Ngxowa, was some kind of renegade who was also making statements to the media on their behalf. They claim he has been suspended. They also claim and are quite angry that Woolworths are “covering up at least 3 other pigs head” incidents at stores. The program of Palestinian solidarity was a provincial program and no one can be suspended for this. We have received no correspondence from NEC of COSAS and therefore dismiss claims and media comments of a suspension as unlawful, unprocedural, baseless and not communicated to Western Cape. We are a militant radical organization and we therefore do not grandstand in the media, the culprits who have made these claims should step forward and identify themselves. We will not allow factional, Zionist, conservative and counter revolutionary individuals to intimidate our radical chairperson Cde Siphakamise Ngxowa. We are an organization not some shabeen, if organizational procedures are not followed then these attempts have no legal bearing. We are well aware of the national COSAS politics at play surrounding comrade Cde Siphakamise Ngxowa and will not allow people to be suppressed because of factionalism or Zionism. Pigs heads and some resources needed for this campaign have come from Jewish people. The gathering of racist white people and armed white militia or “security of a special kind” was organized by the DA and their Israeli funders. The illegal and unpermitted public gathering, which aimed to portray Jewish people as victims- while they still are enjoying the sweet taste of the yoke of white Aparthied privilege, is a mockery to South African black people. The Jewish people in South Africa were with us in the struggle against Aparthied, but this racist DA group called the Jewish Board of Deputies never once through Apartheid issued a single statement to support our black people. We love Jewish people, we love Christian people, we love Quaker people, we love Buddhist people and we even love people who do not believe in God- but we do not love racist and oppressive people. We will write to Jewish Voices for Peace and other progressive non-racist Jewish people to explain to them our campaign. It has become open season on Jews. Expressing anti-Semitism is no longer politically incorrect or intolerant in certain circles. Instead it has become almost fashionable to Jew bash. The silence from politicians, religious leaders and human rights organisations has been deafening. Not a peep, not a squeak, not an oink. Jewish Voices for Peace purport to stand for Jewish values of morality yet they have not made any statement on the disseminating of pigs. As far as I am concerned, this negates any moral and ethical pedestal that they have placed themselves on. They are filled with righteous indignation when it comes to Israel, preferring to compose a laundry list of accusations than address a blatant hate crime against their co-religionists. It must be a wonderful feeling to be able to comment on events that affect the daily lives of us Israelis from the safety and comfort of a computer a continent away. 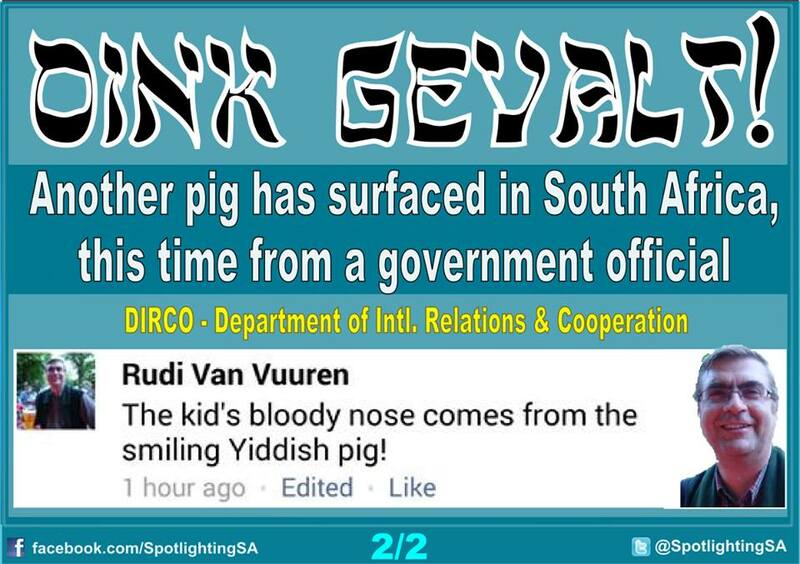 Anti-Semitism has arrived in South Africa. Placing pig heads in supermarkets is profoundly offensive to the Jewish community. It is also offensive to Muslims but nobody has uttered a word. The “Rainbow Nation” that prides itself on racial inclusion has earned itself a very dark stripe. 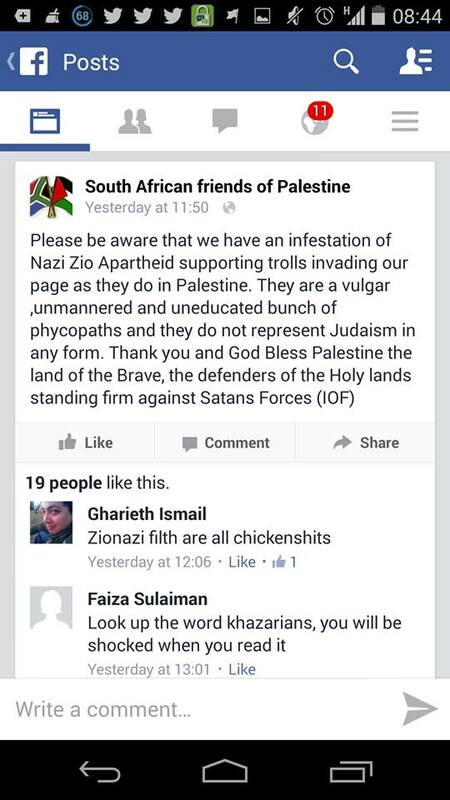 The Anti-Semitic cancer that is spreading around the world has found its way to the Southern tip of Africa. I would wait for the statements of condemnation to come rolling in but I believe that pigs will fly before this happens. Dark days for the Beloved Country.